I think many of us know overwhelm quite intimately and personally. I certainly do. This article is about gradually saying goodbye to this weakening, confusing feeling by simplifying our life on the inside and outside. By letting go of things, habits, beliefs, and more. After Courtney learned she had Multiple Sclerosis, she answered her wakeup call. She turned her stressful, cluttered, and busy life into one with more space, more time, and even more love. By taking slow but steady tenderly radical action steps towards de-stressing her life, she created more with less. 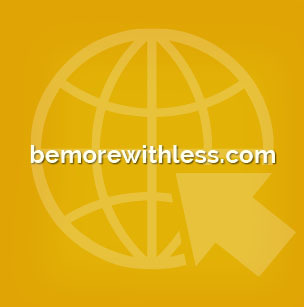 In 2010 Courtney launched her blog “Be More with Less” and became one of the top bloggers dedicating themselves to minimalism. She’s also the creator of the minimalist fashion challenge “Project 333”, which was featured in O, The Oprah Magazine, and Real Simple. 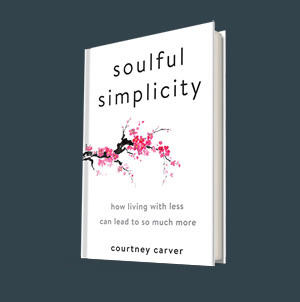 Courtney now published a very inspiring book titled “Soulful Simplicity, How Living with Less Can Lead to So Much More”. Each section of the book is packed with practical suggestions so you can create your own soulful simplicity. “I’m confident that because I got lost, disconnected, and turned upside down, I was able to come out even better on the other side and experience the kind of gratitude you just can’t tap into unless you know what it’s like to live outside of your heart. Not being yourself is exhausting and breaks you down from the inside out. Simplifying my life was the way I remembered who I was. When we hear about the benefits of simplicity, we immediately think of organized sock drawers, clean countertops, and tidy bookshelves, but it’s much more than that if you want it to be. Remembering yourself, connecting with your heart, making you—these are all surprising results of getting simple. You used to know who you were, but all the stuff, obligations, and craziness of life got in the way and clouded your vision. Getting rid of everything that doesn’t matter allows you to remember who you are. Simplicity doesn’t change who you are, it brings you back to who you are. Simplifying your life invites you to start peeling back the layers of excess, outside and in. Once you remove all the things that have been covering you up and holding you back, you can step into yourself, back into your heart, and be you again. 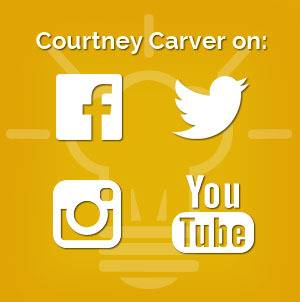 Are you Interested in knowing more about Courtney Carver?